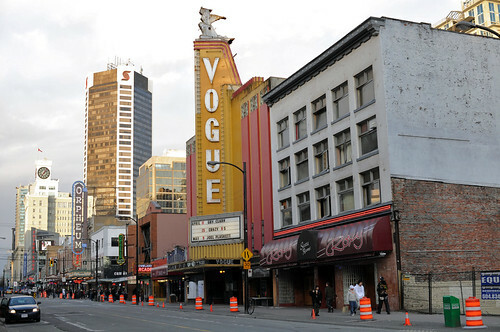 Located at 918 Granville Street, the Vogue Theatre is an icon of Vancouver’s entertainment district. For decades its neon sign topped by the Roman Goddess Diana has stood the test of time and acted as a beacon for everything from theatrical performances and punk rock shows. The 1,178-seat theatre opened its doors for the first time in 1941 and was a movie house operated by Odeon. According to VancouverHistory.ca it was a response to the Capitol and the Orpheum movie houses operated by Famous Players at the time. The Georgia Straight reports that the first film screened there was the 1938 hockey-themed romantic comedy I See Ice. Dal Richards and his band were the first live act to play the Vogue in April of 1941. Originally owned by the Reifel brothers, the Vogue was sold to a development company in 1987 and would lay vacant and silent until 1992 when it became a live performance venue. 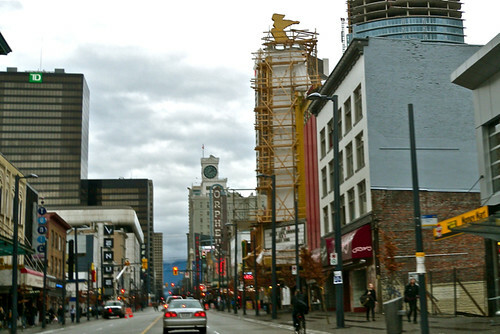 It has also hosted big-time events such as the Vancouverâ€™s ComedyFest, the Vancouver International Film Festival and Vancouver International Jazz Festival. In 2002 the building (exterior) was officially recognized as a National Historic Site of Canada. It’s also the home-base for Vancouver’s “Star Walk” which is currently being re-installed since the Granville Street reconstruction project. I was at a friend’s house a few weeks ago and she lives on Seymour, just behind the Vogue. Big red “V”, “O”, “G”, “U”, “E”, letters sat on the roof as they began to prepare for a restoration in time for the Olympics. I haven’t been by to see the rejuvenated sign but if you have, please feel free to link your Flickr image in the comments. You can find current information about performances by following @VogueTheatre on Twitter.